Girard’s Garage Door Services is a family owned and operated business, dedicated to exceptional garage door repair and affordable garage door replacement in the Eastern Pennsylvania and Western New Jersey region. We use the highest quality parts and materials to repair garage doors properly the first time, at a price you can afford. We handle large and small garage repairs with the same commitment to excellence. When you need garage door repairs, we understand that you need service right away to protect your home and family. Whether you need a new garage door opener, garage door lifter, or a garage door spring, we are ready with same day service for regular jobs and 24-hour emergency service. We understand that it is far more affordable to fix a garage door than to replace it, so we work hard to provide affordable preventive maintenance through safety inspections and garage door repairs, rather than pressuring you for new garage door installation before it is necessary. We can replace your broken garage door spring or garage door lifter in a matter of hours, providing you with the peace of mind that comes from knowing your family and your property are safe. If your garage door is beyond repair or you just want to improve the appearance and value of your home, we offer high quality new and replacement doors. 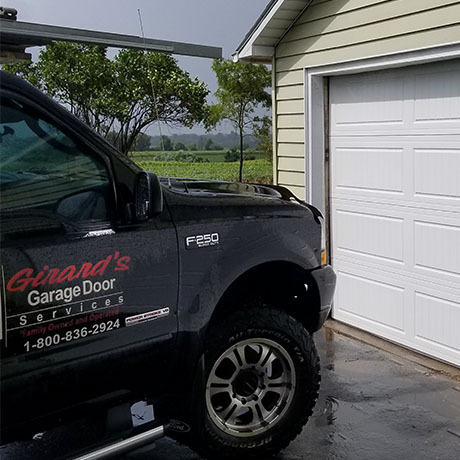 Girard’s Garage Door Services offers affordable garage door repairs and garage door replacement throughout the Pennsylvania counties of Berks, Bucks, Carbon, Chester, Delaware, Lackawanna, Lehigh, Luzerne, Monroe, Montgomery, and Northampton. We also service Warren and Hunterdon counties in New Jersey. Our commitment to high-quality service is allowing us to continue to expand. We provide free estimates and, when you call, a live person answers the phone! Call today for personalized garage door repair and garage door replacement service on all major brands, and the best warranties in the garage door industry.